More background info: Apart from the Wall itself, it was the watchtowers that were the most prominent feature of the border between West and East Berlin. These came in different types (and generations). Most were pure watchtowers, i.e. they would be manned by border guards with binoculars keeping an eye on the border and any person who may have behaved "suspiciously". A rarer type were the so-called command towers ('Führungsstellen'), i.e. here the border-observation duties were co-ordinated. 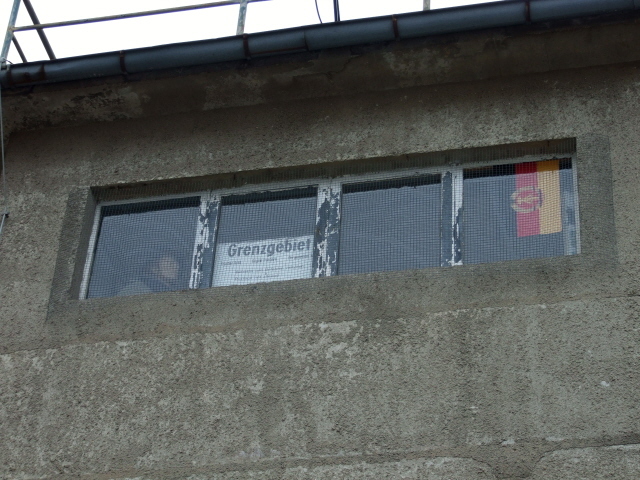 For instance, the command tower at the Schlesischer Busch was the central command point for a total of 18 further watchtowers and all the electronic detection systems in the area (i.e. alarms started by such installations would first be channelled to this command post). These towers also contained utilities rooms, toilets, rooms for border troops, and: arrest rooms, in case anybody attempting to flee to the West was caught alive. The site of the watchtower at Kieler Eck is of particular historical significance, since it was here that the first such person, Günter Litfin, was shot dead by GDR border guards while he was attempting to flee. Once the Wall had "come down", i.e. the border had been opened, the watchtowers too no longer had to serve their original purpose. So they, together with most other border installations, were hastily demolished by the ex-border guards of the GDR, mostly during 1990. Had it not been for private organizations and individuals, probably nothing of the border, including any watchtowers, would have been preserved to serve as the memorials to the former border as these few survivors do now. What there is to see: The Kieler Eck command tower is today in the hands of a private society headed by Jürgen Litfin, the brother of Günter Litfin, who was shot dead by GDR border guards at this stretch of border in 1961. Inside, the building houses a small museum about the border and its victims, but the interior and its exhibition are only seasonally accessible, and by guided tour only – see below. Unfortunately I haven't yet managed to catch a tour of this site. I will try again next time I'm in Berlin. The tower stands as an odd kind of 'island' in the area around, which has changed beyond recognition. It is now surrounded by new housing built in the 1990s, so that hardly any near-authentic impression of the former function of the watchtower remains, which was to guard the entire stretch of border down by the canal, including the border at Invalidenfriedhof cemetery (where some Wall remains can still be seen today). The watchtower of the same type (command tower) at Schlesischer Busch manages somewhat better to retain an impression of the wide expanse that it used to keep under surveillance – here at least the area around the tower has not been built up, although it is now a rather pleasant park instead of a menacing deadly border strip. Nearby, a few Wall remains are also still to be found. The inside of the tower is now home to art exhibitions managed, together with various other venues, by a nearby art society – so the tower is theoretically open to the public at certain times (see below), but unfortunately I haven't yet managed to be there at the right moment to get a chance to see the inside. So I can't comment on what there may be to see. 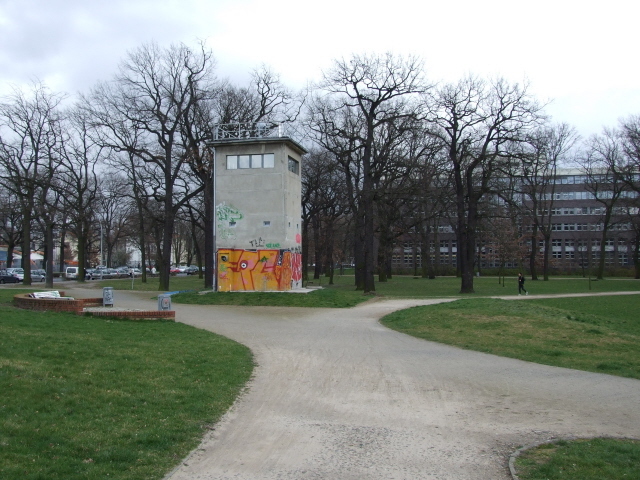 Locations: The Kieler Eck watchtower is to be found just on the northern edge of the district of Mitte, north of the Invalidenfriedhof (see Wall remains) near the end of Kieler Straße, a cul-de-sac branching off Scharnhorststraße. When walking up along the banks of the canal from Invalidenfriedhof, which is the most likely approach, then look out for the tower to the right once you've passed some rather new buildings – it's easily missed coming from that direction (I had to retrace my steps once I got to the bridge beyond, and only saw it from the path walking back in the opposite direction). The watchtower in the Schlesischer Busch park in the district of Treptow is much more easily visible from approaching the park on Puschkinallee or from the bridge across the Flutgraben canal which marks the border to the district of Kreuzberg. The watchtower on what is now Erna-Berger-Straße is somewhat hidden behind government buildings and the massive high-rise complex of Potsdamer Platz. Coming from Potsdamer Platz station walk down Stresemannstraße, Erna-Berger-Straße is a small side street branching off to the right – or left, if you're coming up Stresemannstraße having turned into it from Niederkirchnerstraße (see Wall remains). Access and costs: varies, generally quite restricted. Details: Kieler Eck – you can get there on foot from Invalidenfriedhof (see also Wall remains), which is within easy walking distance from the Hauptbahnhof central station. This is served by several regional metro trains too (including S5, S7, S9) allowing easy access to the hubs of Friedrichstraße, Alexanderplatz and Zoo. You could also walk from the metro stop Schwartzkopffstraße (U6) up Chausseestraße and turn left into Boyenstraße to get to Scharnhorststraße/Kieler Straße. Admission is free, but the opening times of the small museum inside the watchtower are a bit uncertain. The times I found advertised most recently are: only seasonally, March to October, from Sunday to Thursday between 11:30 a.m. and 2 p.m., with guided tours starting every 30 minutes in between. Guided tours are now the only way of seeing the inside. Group sizes are limited to a maximum of 15, so it's advisable to be there early or make arrangements in advance (groups can also arrange other times than those advertised). I know that Jürgen Litfin, who by now is not the youngest any more, has been struggling to keep up his commitment to conducting these regular guided tours. It remains to be seen what will happen in the future. Maybe some volunteers can be drafted in to take over some or all of this commitment. Next time I'm in Berlin and have the time I will try to find out more. UPDATE: I did try again in August 2016, again at a time as advertised. Again I waited a long time and had nearly given up again, when Jürgen Litfin did turn up after all. However, he was surprised to find visitors there, saying it was Sunday, even though it said on the door that it would be open at that time on a Sunday. Anyway, he had damaged his knee and couldn't climb the steep ladders inside the tower – and wouldn't let any visitors go up there on their own (understandable). So I was unlucky again, but at least I had a chance to talk to Jürgen Litfin for a bit, which was interesting and also fun (you couldn't wish for a more prototypical example of “Berliner Schnauze” … and I happen to love that dialect and frank manner of speaking!) He indicated that he may have to get more people to help run the place, and hopefully that will indeed happen. It would be a shame to lose this important piece of Berlin Wall commemoration. Schlesischer Busch – on foot from Schlesisches Tor metro stop (U1) down Schlesische Straße (eastbound) across the bridges and into Puschkinallee, or walk up Puschkinallee westbound from the regional metro train stop Treptower Park (S8, S9 and Ring trains). There's also bus 265 going along Puschkinallee. The interior of the watchtower is used by a local artists' organization and at the time of writing (May 2016) supposed to be open to the public between May and October on Saturdays from 11 a.m. to 2 p.m. and on Sundays to 5 p.m. (as well as by appointment). There is no mention of an admission fee. What's to become of the tower and especially its opening times, is, however, likely to keep changing. 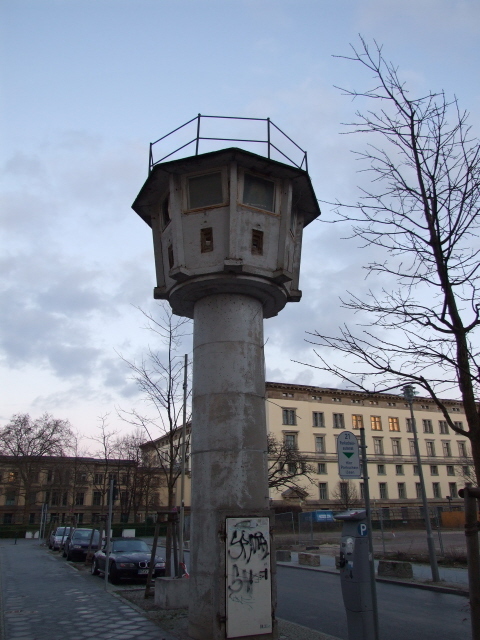 The watchtower on Erna-Berger-Straße is within easy reach of Potsdamer Platz station (S1, S2, and U1) off Stresemannstraße, but can only be viewed from the outside. No access to the interior. Time required: The watchtowers will most likely be viewed as part of a longer Wall remains walking tour – which can be tailored freely. Viewing the towers from the outside only doesn't add significantly to the time allocated to any such walking tour. The limited space inside also means that even if you do go and see the exhibitions inside (when open), you won't need to add more than, say, 20-30 minutes extra. The watchtower on Erna-Berger-Straße near Potsdamer Platz requires only a couple of minutes for a quick look. Combinations with other dark destinations: in general see Berlin, Berlin Wall and Wall fragments and remains. 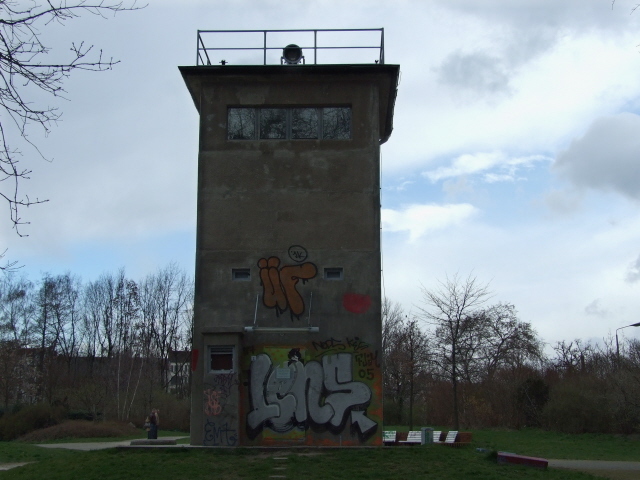 The watchtower at Kieler Eck is closest to some of the most important stretches of Wall remains, and a visit could well be worked into a tour connecting Invalidenfriedhof and Bernauer Straße. The watchtower at Schlesischer Busch can best be combined with a visit to the East Side Gallery to the north-west and/or Treptower Park with its Soviet War Memorial to the south-east. 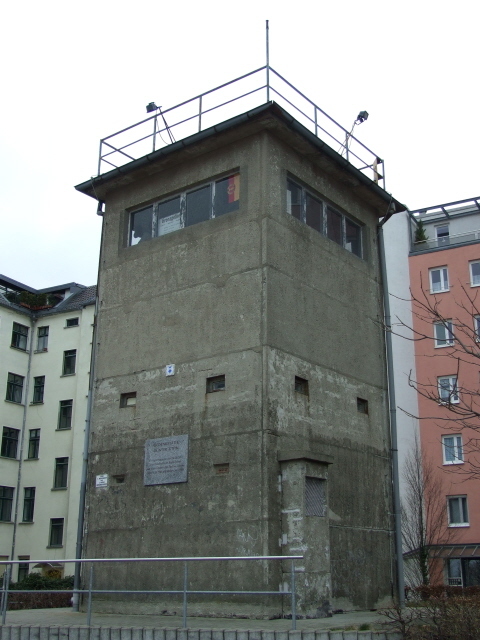 The watchtower at Erna-Berger-Straße near Potsdamer Platz is close to the Wall remains at Niederkirchnerstraße at the Topography of Terror exhibition, and the Museum House at Checkpoint Charlie, both towards the east. To the north the Holocaust Memorial isn't far, a bit up Ebertstraße. A roof-top observation point akin to a command post watchtower can still be seen atop a converted warehouse at the southern end of East Side Gallery, just north of Oberbaumbrücke. If you can't get enough of former border watchtowers, there are a few more of the command tower ('Führunsgsstelle') type structures surviving along the "outer ring" around the rest of West-Berlin (that is, not part of the Wall 'proper', in the narrower sense of the border slicing through the centre between West and East-Berlin), and thus in fact just outside Berlin's territory proper. One of them, in particular, may be worth the trek outto its far-out location in Nieder Neuendorf, as inside there is a small border museum. It is therefore given its own separate chapter here. Another one, formerly the 'Führungsstelle Bergfelde' in GDR times, is not open to the public as such – it serves as a base for an ecological youth organization (they do organize tours for people interested in their work, and as part of it you may also get a glimpse inside the tower – which, however, has been totally renovated and often hosts school groups). It's hidden in the now forested-over area just outside the northern edge of Berlin at the border to Hohen Neuendorf, in a spot somewhere near the Hubertussee lake. In other words, it's also quite a long way out and certainly only for the most dedicated Wall aficionados (as you can normally only view the tower from the outside – if you can find it). The closest bus stop is on Hubertusweg in the Berlin Forest of Tegel (line 125, from the Frohnau station on regional metro train line S1 – which is also the line that takes you to Oranienburg for visits to the former concentration camp memorial site at Sachsenhausen – or from Alt Tegel, metro line U6). In the south, in Kleinmachnow, there is a canal-side former watchtower (at an ex-border-crossing point for boats) that has been converted into some sort of café that these days forms part of a camping/caravan site and hotel complex. See under Checkpoint Bravo. 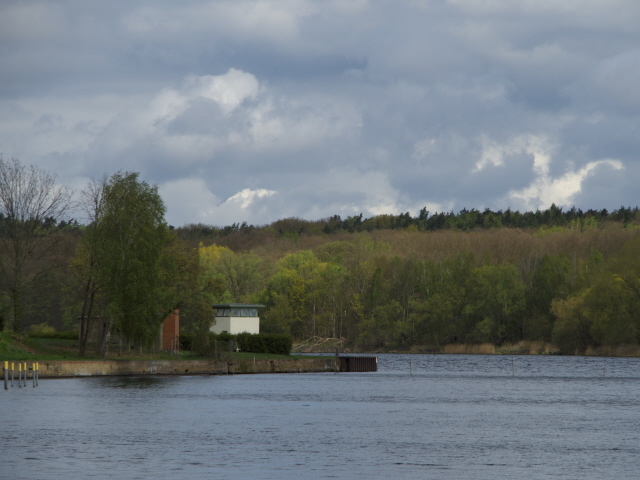 Finally, there's also a watchtower at a similarly remote location on the waterfront in the north of Potsdam, set back a bit from the actual former border a few hundred yards north of Cecilienhof on the shore of Jungfernsee lake. The tower, called “Bertiniturm”, now standing empty and abandoned, used to be part of special waterway border crossing area for goods traffic by ship. There was also a barrier between this shore and the one opposite (“Bertinienge”), and a steel rope with netting could be raised to prevent any boats or swimmer/divers getting through. A few vestiges of this can also still be seen. The fortifications, fences and stretches of proper wall that for GDR citizens blocked any access to the waters here have in the meantime all vanished, though. The only commodification for visitors is the blow-up of a large b&w aerial photo of this area as it was back then, so you get an impression of what kind of infrastructure the tower used to be part of. Combinations with non-dark destinations: in general see Berlin. 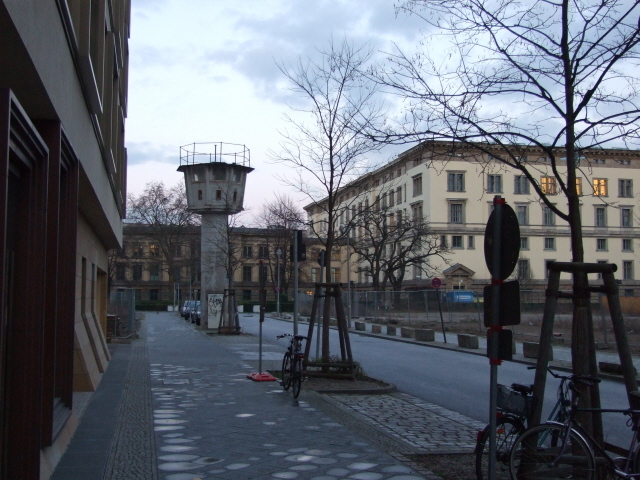 The watchtower at Kieler Eck is fairly close to the mainstream tourist areas of Mitte, including the Museum Island. The watchtower at Schlesischer Busch is further away from anything that's normally on mainstream tourist routes (although at least the East Side Gallery has almost become part of the mainstream package for Berlin). The watchtower at Erna-Berger-Straße is just round the corner from various touristy sights, esp. Potsdamer Platz with its glitzy Sony Centre, but it's also fairly close to the Brandenburg Gate, for instance.